The dental implant is a small titanium screw that is inserted in the mandibular and / or maxillary. The dental implant is used to replace one or more teeth on one or both arches. What are the advantages with dental implants? 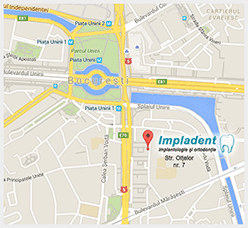 The dental implants are fixed and restores the patient a smile comparable to natural. Implants can last for the life of the patient. Due to plants the patient can regain their teeth during the day. Implants prevent bone loss in ‘ area where the teeth are missing. Who can insert an implant? Typically, dental implants can be used on all types of patient. Patients may be more or less adults and in cases of impediment for health reasons specific Workarounds may be total or partial dentures, bridges, or similar items. Am I at an age too advanced for me to insert an implant? The patient’s age is not a discriminating factor for interventions implant. A person more or less adult intervention can be carried out without difficulty. Whenever there are special conditions of general health, the patient’s general highlighted in history and their doctors will require specific tests prior to the intervention to assess the general physical condition before embarking on the path implant. The system can not integrate? The material with which the implant is made ​​is titanium. Titanium is used in medicine in different implants and instruments used in the agenda for its own absolute compatibility with the human body. siginifica This does not, however, that the systems can never lose. A bad oral hygiene, withholding regular check-ups after surgery, may be the main causes for a fallimneto of implant treatment. The plants are guaranteed after surgery? All interventions implant are guaranteed for 10 years from the date of surgery. The warranty’s implant is also certified as a real passport implant which contains all the data of the inserted implants with all their technical characteristics. remember that the guarantee to be maintained good condition is essential that the patient is traveling to all follow-up visits with the professional and agreed to be rigorous in their oral hygiene. What is the time to insert an implant? Thanks to the established technique of immediate load implant, the patient will regain their smile in a few hours. On the same day you can pull out the old elements of the patient and insert dental implants. After a few hours crowns or dentures can be anchored to plants just entered, allowing the patient to ribonificare completely prorpio oral health status. For phobic patients can insert implants without pain? Yes, thanks to the technique of conscious sedation our anesthetists allow you to take the implant surgery without feeling any pain. The anesthetist use of specific drugs that will create a state of the patient is sleep-wake cycle such that the intervention and its steps is not will not even perceived. What care do I need after an implant? Oral hygiene is the key element. The patient should try to maintain an optimum condition for cleaning so that the implant prosthetic component and eliminate the risks of infection. Monitoring visits after surgery should be performed periodically as agreed with the professional. During the healing process I can smile quietly? Yes, the specialist will apply a temporary prosthesis or readapted the existing denture for the duration of the period of osseointegration of the ‘implant in the bone. The Clinic will investigate all your living conditions and your general state of health. Presence of certain chronic diseases, systemic vascular, poor oral hygiene or bad habits, are all conditions that can cause problems. Success rates are average of 97%.